BEFORE I SHARE MY STORY, PLEASE BE SURE YOU WRITE YOUR CONGRESSMEN/WOMEN TODAY IN PROTEST OF SOPA AND PIPA. Wikipedia has made contacting your representatives easy. Click here. I have no idea how I forgot this story. But the other day, it surfaced in my mind like Luke Skywalker’s X-Wing from the bog on Dagobah. I have to write this down, I thought to myself. 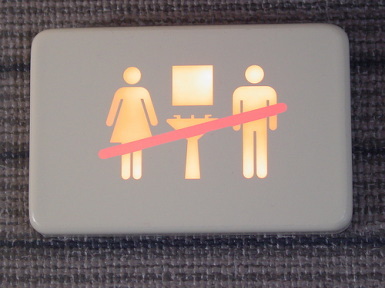 I once had a coworker (we will call her Mae) who hated airplane bathrooms. She was in her early sixties and had a wonderful sense of humor, but she occasionally managed to shock me. Mae hated airplane bathrooms so much that she wore Depends adult diapers whenever she traveled by air. She told people about this quite openly. Fast-forward a few months to my 2002 flight from Chicago to Frankfurt, Germany. My final destination was Minsk International Airport in Minsk, Belarus. I spent the summer that year teaching English to children at a medical camp in the town of Kobryn. On the flight to Frankfurt, which lasted 11 hours if I recall correctly, I was awake the entire time. I had never flown before that day. I stayed up all night watching I Am Sam, A Beautiful Mind, and Monsters, Inc. on the in-flight movie monitor affixed to the back of the seat in front of me. I was like a child in a candy store, albeit an airborne candy store. Shortly before landing in Frankfurt, I saw a man who resembled Mae’s husband waiting outside the airplane restroom. After he entered the restroom and emerged from it, I saw him sit down next to a woman whose hair resembled Mae’s poofy ’50s period haircut from behind. It can’t be her though, I thought to myself. What are the odds of us both flying to Germany at the same time? When the plane landed, the woman turned around to retrieve her baggage from the overhead compartment, and I realized it was indeed Mae. My immediate thought: Holy crap. That lady probably just crapped her pants at 30,000 feet. I said hello to her and her husband, and I hope she didn’t notice me eyeing her pants, trying to determine if she was wearing Depends or not. Previous postEvery Time a Dog Makes a "Deposit," Jennifer Luitwieler Sells Another Book Next postDownload CTJ's Free 35-Song Anthology: "Source Materials & Sorcerer Materials"